President Obama has announced a dramatic, new reauthorization plan for Federal Railroad Administration (FRA) programs as part of his recently released 2014 budget proposal. The Administration clearly put major effort into the structure of the program, which offers a comprehensive and integrated strategy for a modern, national freight and passenger rail system. The President is requesting $40 billion over five years for a major new initiative, the National High Performance Rail System (NHPRS). This program addresses virtually every component of infrastructure, every type of system operator, and every market served by these systems. Its goals are to meet the growing demand for rail service, enhance the nation’s global competitiveness, and support domestic manufacturing and job growth. Can you click here to send a message to your Congressman right now to let them know you support the Obama Administration's proposal to fund high-speed rail? The budget requests $2.7 billion for CPRS in 2014 for state corridors ($300 million), the Northeast Corridor ($675 million), long-distance routes ($800 million), and “National Assets” ($925 million) including “backbone” rail facilities, the national reservations system, security, and debt service. This CPRS request is roughly double what Amtrak received in 2012 and is focused on getting the existing system up to a state of good repair. This includes replacement of aging equipment on many corridors, tackling the backlog of Northeast Corridor repair needs, and bringing stations into ADA compliance. It also offers freight railroads a huge incentive – the implementation of Positive Train Control, which will be required on all Amtrak routes by 2015. 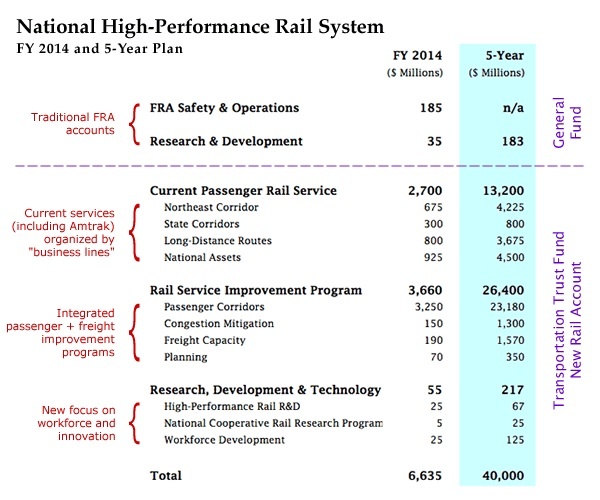 The largest component of the NHPRS is the Rail Service Improvement Program. At $3.7 billion, it constitutes 55 percent of the President’s total 2014 FRA budget. $3.25 billion of RSIP is Passenger Corridors, a program area funding new or substantially improved passenger rail routes, including infrastructure, stations, and equipment for service upgrades. This program would also fund Positive Train Control on commuter railroads. Passenger Corridors projects must be identified on a state rail plan or multi-state regional rail plan to be eligible, and the FRA estimates $10 billion worth of corridor projects could be ready to compete for the requested funds by next year. The agency projects that most of those grants would advance Core Express (125-mph+) corridors. Two other important parts of RSIP are the Congestion Mitigation and Freight Capacity programs. These programs target improving the freight network by adding capacity and removing bottlenecks, upgrading shared-use infrastructure in terminal areas, safety enhancements and rail line relocation, and even short-line capital upgrades. Over the five-year NHPRS authorization, RSIP would receive a total of $26.4 billion, CPRS would receive $13.2 billion, and R&D would get $217 million. Remarkably, the Administration’s budget proposes an additional injection of $50 billion in FY 2014 for Immediate Transportation Investments in highway, aviation, and rail to jump start the investment in infrastructure. Of this amount, $5 billion is proposed for FRA programs – $3 billion for RSIP and $2 billion for CPRS. This brings the total FY 2014 FRA request to $11.6 billion. Download the entire budget estimate here. Can you take a minute to click here and make sure your Congressman knows you support the Administration's high-speed rail proposal?